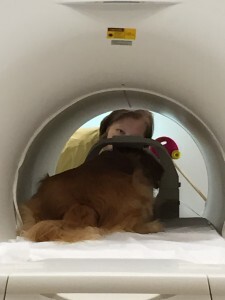 The Dog Project uses fMRI and field behavioral experiments to study canine cognition, emotion, sensory reception, receptive communication, and inhibitory control. The Emory-CPT team of Dr. Greg Berns and Mark Spivak co-founded the project and became the first research team worldwide to obtain quality fMRI images of any non-human animal obtained without the aid of sedation or restraints. Their accomplishments received media acclaim and funding from the Office of Naval Research (ONR), which allowed for an expansion of the project. Pearl is shown the pink car during Experiment 6. Peter Cook, a researcher on The Dog Project team, presents the object per a run sheet schedule and time codes the experiment with an fMRI button box. Experiment 6 and the accompanying Experiment 6B study canine reward preference. Experiment 6 is an fMRI experiment conducted at Emory University, whereas Experiment 6B is a field behavioral experiment conducted at CPT. Experiment 6 examines whether dogs prefer social reward (visual contact and praise from the owner) or appetitive reward (treats). The experiment also examines whether the optimal reward may vary randomly amongst dogs or whether the ideal reward is correlated to the temperament profile of the dog. The proper selection and presentation of rewards is essential for maximizing motivation and learning during training periods. Yet, there is disharmony in the dog training industry regarding reward selection. Some training and behavioral pundits insist on employing food training with all dogs. In contrast, other training and behavioral pundits deplore food training. They believe that all dogs should be trained solely with praise. After 10 seconds we provide social reward when Vicki comes into view and praises Pearl. Since we can not obtain quality images unless Pearl is absolutely motionless, we present the object stimulus for 10 seconds before introducing the reward stimulus. We obtain the vast majority of our data during the anticipatory reward period when Pearl is likely stationary. However, we only occasionally obtain data during the reward period, as upon exposure to the reward the subject dogs frequently move greater than the 2 mm spatial distance that creates noise artefacts in the image. At CPT we prefer to use empirical data and valid science, rather than unsupported conjecture, when determining our training methodologies. Therefore, we hope that Experiments 6 and 6B help settle the question regarding the optimal methodology for reward selection. 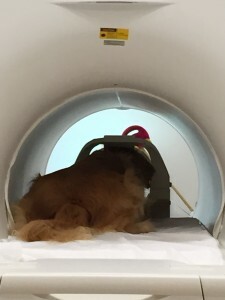 In Experiment 6, we conditioned experienced MRI dogs to understand that the visual stimulus of three separate objects will precede a specific forthcoming event, with each object functioning as the precursor to a separate event. The visual exposure of a pink car means that after 10 seconds the owner will appear to praise the dogs (social reward). The 10-second visual stimulus of a blue bird means that the dog will receive a food reward from a skewer (the “treat kabob”). The visual stimulus of a gray hairbrush (our control) indicates that nothing significant will occur. 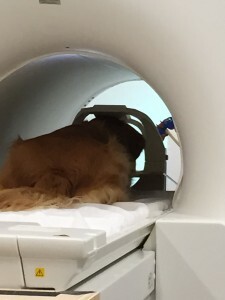 After the pre-set conditioning period, whereby we assumed the dogs understood the relationship between the specific object and the subsequent reward or absence of reward, we scheduled the dogs for live fMRI sessions. During the fMRI sessions we measure the blood-oxygen-level dependent (BOLD) contrast image that indicates dopamine activity in key anticipatory reward centers of the brain, most prominently in the caudate nucleus. We wish to gain information whether the dogs have greater caudate activity for the car, the bird, or the hairbrush and whether there is predictability as to what the dogs prefer based on their temperament profile. Pearl observes the blue bird during Experiment 6. After 10 seconds Pearl will receive a food reward from the treat kabob. Please note that the cover photo shows the control stimulus of the gray hairbrush. We expect that our upcoming paper that summarizes the data of our Experiment 6 and 6B MRI and field “Reward Preference” experiments will receive excellent media attention. More importantly, the paper should provide value to the dog training community. We hope that our research will benefit the trainers and owners of working and pet dogs and provide a higher quality of life to the canines and pets enrolled in training programs.